A Swiss tourist has been trampled to death by an elephant in southern Thailand. The incident happened during what was supposed to have been a peaceful ride through the jungle. Two elephants who were carrying the 63-year-old woman and four other tourists crossed paths and began fighting in a forest in Surat Thani province. The woman was thrown to the ground when one of the elephants reared up and trampled on her repeatedly, Police Lt Col Apidej Chuaikua said. As freakish and tragic the incident is, it does highlight the importance of people taking out travel insurance before they embark on a trip. 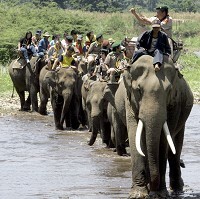 Four other tourists suffered minor injuries when they jumped off the elephants' backs and fled, he said. It is unclear what the nationalities of the other tourists were.